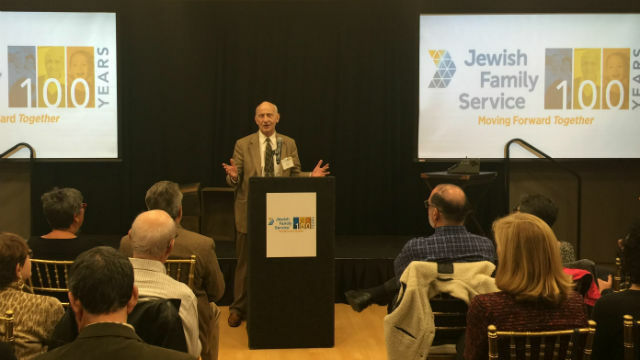 Philanthropist Ernest Rady on Thursday announced a $20 million commitment to Jewish Family Service of San Diego as the organization enters its centennial year. The gift from the Rady Family Foundation is the largest known commitment to a Jewish community organization in San Diego. It consists of a one-time gift of $3 million and $17 million to match gifts by others. “We are deeply committed to the long-term sustainability of Jewish Family Service because of the critical role it plays in the lives of tens of thousands of people of all faiths and backgrounds across San Diego County — and we challenge the community to join us in supporting this vital resource long into the future,” said Rady and his wife Evelyn in making the gift. “Together, we can make sure JFS never has to tell someone in need, ‘We can’t drive you to your doctor’s appointment, or provide you with a hot meal, or offer counseling to get you through this rough patch,’ because the agency doesn’t have the necessary resources,” they said. Founded in 1918, JFS assists more than 25,000 people of all faiths annually. It is one of only four refugee resettlement agencies in the county, serves as the largest provider of senior transportation services, provides 80,000 hot nutritious meals annually and offers employment and career services, and much more. « Opinion: The Mayor Speaks for NAFTA, But Is President Trump Listening?